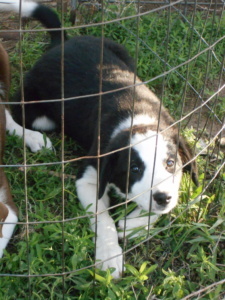 The Barnyard Weed Warriors has 3 border collies on the duty at all sites. The dogs are used to assist the wrangler in maintaining control of the herd and for protection against any and all predators. The dog crew consists of Miss Allie, Jinx & Joy; a mother and two daughters. Fly is the newest member of the dog crew! Joy gave birth to her first litter on February 19, 2018 and Fly was the first puppy born, from that litter. She will just be learning her basic commands of sit, stay, down, and some very basic working commands, during the 2018 season. When she turns 1 year old, she will be going to a professional trainer, to fine tune her natural working dog instincts. We are very excited and looking forward to discovering Fly’s special talents. Miss Allie turned 12 on January 14, 2018. She has been working for Mary since January 17, 2008. 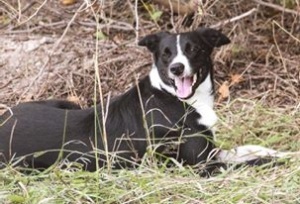 She is a traditional medium length, rough coat Border collie, which is a little smaller frame than her daughters. Miss Allie loves attention and will smile for cheese or any other tasty treat (We ask that you not feed the dogs treats without permission.). Occasionally, Miss Allie will ‘sing’ on command, which consists of howling with Mary. Allie will be transitioning into retirement, starting in 2018, as old age catches up with her and finds it more difficult to keep up with the other dogs. Jinx, the eldest of Miss Allie’s daughters turned 7 years old on November 27, 2017. She isn’t as sociable as the other dogs, because she is serious about her work. She focuses on her job and protecting Mary, so, if you do visit the site, please ensure Mary knows you are there and wait until Mary acknowledges you and ‘downs’ Jinx. Jinx is the most agile of the dog crew and she is very fast, jumping over fences and into Mary’s arms on command. Joy, also called Joy-Joy, turned 5 on November 10, 2017. She is a full sister to Jinx and is still learning the ropes as a herding dog and is very sociable, unlike Jinx. Joy does have two vices that we do not like to encourage; jumping up on people and licking them with her lightning fast tongue and we can’t hand feed her as she accidentally takes more than the food, at times. Jinx and Joy are a bit larger framed and shorter hair than their mother, due to the fact that their father was from a bloodline bred specifically for working cattle. The shorter hair is easier to manage when the dogs go into the brush, unlike Miss Allie’s which requires more grooming. Border collies have over 500 years of breeding behind them, to give them the natural instinct of herding. 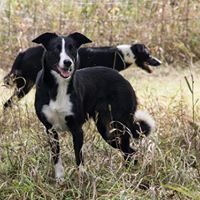 Our herding crew is not professionally trained, they have learned to work with Mary and she has learned to command them in a way that they understand. These dogs are hand, whistle and voice commanded. When we are on site, we prefer that you do not pet the dogs through the fence as it is electrified and you might get shocked. There are times when Mary can bring them out of the fencing, for meet and greet time, but there are times when they are working and Mary will have to decline the request. 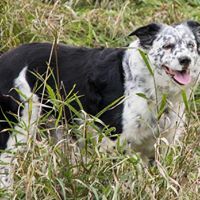 If you would like to learn more about the border collies, you are welcomed to ask Mary or you can go to the American Border Collie Association website or watch Border collie videos on YouTube.